I spent my Sunday afternoon this week perusing the International Fragrance Association (IFRA) website. IFRA prohibits and restricts the use of many beloved perfume ingredients. Some of these ingredients cause sensitization, phototoxicity, are carcinogenic or have the "critical effect" of genotoxicity (they mess with your genetic info). These are serious issues and IFRA also advises on the use of such ingredients to flavor products that come into contact with our mouths and digestive systems: tobacco, toothpaste, pastilles, syrups and the like. What got me on an IFRA kick in the first place? I've been testing LOTS of perfumes recently that are full of Iso E Super and I was wondering what IFRA had to say about it. Iso E Super is on IFRA's restricted list (as flavoring) due to its critical effect of sensitization; it can cause an allergic response (one that may worsen with repeated use). You can smell Iso E Super in hundreds of perfumes and in toiletries, home fragrance sprays and candles, and household cleaning products, like laundry detergents and dryer sheets. If you research Iso E Super, you quickly see it has some problems: it's suspected of being bioaccumulative in people and it can be deadly (as many chemicals, aromatic or not, can be) to aquatic plants and animals (those in your home and in nature). I suspect Iso E Super's widespread use in laundry products, and the fact Iso E Super is often joined by "white" musks, sensitized me to its tangy, faux-wood aroma. Years ago, I bought several tiny vials of pure Iso E Super to acquaint myself with it. My perfume collection certainly includes lots of perfumes that contain Iso E Super, but over time, I've had to give away or discard perfumes that I once liked because when I smell them now, all I smell is Iso E Super (given time, does it EAT UP other ingredients that share bottle space with it?) Perhaps, as it has accumulated in my body (only partly joking here), I've developed a distaste for Iso E Super. When I read a list of notes that includes "wood accord," "soft woods" or even "cedar" or "woody amber" I'm suspicious and sample that perfume on my body for a few days before I even think of buying it to make sure Iso E Super is not present or assertive. You know where this review is leading, right? 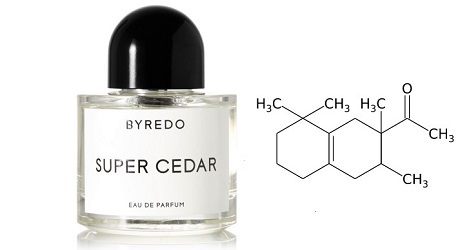 Byredo Super Cedar1 PR may talk of cedar trees, turpentine and pencil shavings but Super Cedar serves up what smells like almost-pure Iso E Super. A nasty trick, especially since such a "perfume" already exists: Escentric Molecules Escentric 01 (but if/as you read her review, you'll see that Robin here at NST™ does not dislike Iso E Super as I do). I wore Super Cedar full-on (full-body, not just on arms or wrists) for one day for this review; it had been on my skin for ten hours when I came home and scoured myself in hot water and soap. My shower didn't budge Iso E Super from my skin. The clean shirt I wore AFTER my shower absorbed Iso E Super as if I had sprayed it on the fabric. The next morning, my sheets smelled of Iso E Super. My laundry room still smells like Iso E Super five days later because that post-shower shirt is in a hamper there. Bioaccumulative, indeed!!! Byredo Super Cedar Eau de Parfum is, in my opinion, ridiculously priced at $150 (50 ml) or $230 (100 ml). Super Cedar is out of stock at many retailers, so I am definitely an outlier when it comes to Iso E Super. As always, feel free to tell me how wrong I am (about Iso E Super in this case) and share some of your favorite Iso E Super-rich perfumes in the comments section. And: Happy Thanksgiving! 1. Super Cedar was developed by perfumer Jérôme Epinette; the listed notes feature rose, cedar, musk and vetiver. Note: top right image of Iso E Super structure via Wikimedia Commons. An outrageous price for an ISO E Super-bomb, particularly when you consider that Lalique Encre Noire can be had for under £30 in the UK! Lizzy, true…I have never seen a Byredo at a discount. Great review, Kevin of what sounds like a horrible fragrance! I *really* appreciate your iso e super rant, as I feel the same way you do! It literally makes me sick so if I detect it at a sniff, I won’t put that perfume on my skin. Rappleyea…it’s a very polarizing ingredient! We’ll see if any fans chime in. Funnily enough, I don’t actually mind the smell per se (Laurie at SSS sent me a vial of it undiluted) but after a few minutes… ruh roh! I actually owned and finished a bottle of Molecule 01 a number of years ago. I discovered it when I was doing ceramics at a studio and the whole place always smelled like cedar, in a good way. I finally found the culprit who told me what it was. It is TENACIOUS and does take over the room(s). Anyway, I’m kind of over the iso-e soliflore thing so will probably pass on this one, but thanks for taking one for the team! I couldn’t stand iso e super overload early in my forays into this hobby (especially Terre d’Hermes in 2008). What many don’t seem to know is that if you want a cedar scent you can go to a site like Bulk Apothecary (I am not affiliated with them in any way) and not only buy some really good wood essential oils, but if you look at the comments for some of them, you will see some simple formulations suggested so that you can make a wood scent with a bit of complexity. Bigsly…sounds snobbish but I think Iso E Super is a no-brainer…adds in that woody element with ease…and people do like it to boot. When I sampled Encre Noire — which frankly repulsed me — and placed the tester strip in the trash bin under my kitchen sink the smell was still so pervasive that I had to fish it back out and dispose of it outside. Coincidentally I gave Terre d’Hermes another squirt today (that one did appeal to me initially) but now all I smell is a rather monotone “cedar.” This informative review is something of a wake up call. Sounds as though I might be doing the planet a favor as well if I can forego this ingredient entirely. SFGUY…BOTH of those have hefty doses for sure! in tiny mouse like voice–i like iso-e super. I know perfumistas in general hate it, but on my skin it is magical. Molecule 1, Terre d’Hermes, and most things by Geza Schoen seem to have lots, and I tend to love them. People spontaneously compliment me on my fragrance, which is rare (big things like Onda are an acquired taste). After Molecule 1, the JHAG version seemed a copy, and I rolled my eyes at that. I haven’t yet bought the straight chemical and tried it. I think that would be fun. Hey, be loud and proud in your love of Iso E Suoer…I hereby bequeath my share of it to you! What a rip-off, Byredo! They must be very cynical to add such this to the line. I’m deeply vexed that IFRA has caused complex natural ingredients to be replaced with monotonous cheats like Iso E Super. There are so many perfumes now that start off with interesting top notes (Ormonde Jayne is a prime example) but soon devolve into nothing but Iso E Super. My nose gets bored with it very quickly, and then the suffocating monotony irritates the heck out of me. Noz, I believe Iso E Super is under review and it may go the way of lime, grapefruit, verbena, bitter orange and others. IFRA’s website is so confusing! The EU and US have been petitioned to look closer at Iso E Super…it joins the ranks of the zillion things that can harm us. Now I’m curious Kevin. What are some other popular fragrances that have it? Does it always smell like cedar? missyl: it’s in so many, some with supposedly high concentrations are	Ormonde Jayne perfumes, Hermes Poivre Samarcande, Cartier Declaration, Feminite du Bois, Creed Aventus, Lalique Perles de Lalique, Comme des Garcons Kyoto and Jaisalmer, Kenzo Air, Lancome Tresor, Prada Luna Rossa…on and on. Truly, the woody scents I’m trying lately all seem to have it. Jean Claude Ellena loves it. I think Terre d’Hermes uses a lot as well. If asked, I couldn’t knowingly identify Iso E Super as a note, but I’m sure I just don’t like some of the perfumes known/thought to have it. They all smell like shampoo and very synthetic to me: D&G Light Blue, Chanel Chance Eau Tendre, and the like. Maybe they just don’t use large amounts of it, because it doesn’t smell quite woody. I have a growing sensitivity to these, as well as some sharp floral found in LVEB, Olympea, and Mon Paris. I just trust my gut and stay away. redskyatnight: it’s hard to pinpoint a culprit that affects us in a scent…some of the (rare) perfumes that give me headaches don’t really smell that similar. I’m glad you brought this up, Kevin. I do think ISO E Super is becoming a bit of a crutch in perfume construction. I’m particularly shocked by the success of Escentric Molecules ISO E Super fragrance. It’s one molecule, diluted in alcohol and way overpriced. sullapelle: I don’t get the success of that one either! Sounds boring. Byredo strikes me as cynically inadequate in general. I actually do enjoy Iso Super E, though as mentioned above I feel like perfumers use it to replace a well-crafted drydown. Brin de Reglisse is guilty of it but I sure love it. Funny, I’ve been testing this frag, and wondering why I wasn’t connecting. Kevin — speaking of Iso E Super — did you see that there’s been a new Molecule series announced with (synthetic) sandalwood as its subject? Pimientas: thanks for that! Aaaahhhhh, the memories that sandal cyclopropane stirs in the breast! (Isn’t cyclopropane HIGHLY FLAMMABLE!?) I can’t find it in IFRA’s lists…even as Javanol. I didn’t mind it at first, but now I find it very boring and turns me off a scent if there is too much of it. I hope it gets restricted as it seems very over-used. Well, you have just ripped apart what I thought it was going to be my future signature scent. Don’t get me wrong, I’m neither blaming nor accusing you I’m just protecting my own, personal, egocentric “imaginarium” on a perfume that I haven’t even sampled, but my mind stubbornly settled on. I stumbled upon this fragrance label that read “super cedar” and instantly I knew I had to have it (still not 100% sure, being a little bit pricey and not having the chance of testing it) so, first I had to hunt for some reviews .. see what people think of it, if it is worth it and all. Et voilà ! I find your complex review and it’s not praising the product at all. To be honest, I don’t have any knowledge on the molecular/chemical/biological spectrum of a fragrance, if they’re harmful or mess with your genetics, leading to side effects (like losing your taste buds or turning you into a Hulk ?!) henceforth my commentary contribution is pretty useless around here. Still, many years ago I owned a pencil which I would doodle with and I remember that occasionally it would emanate a gentle, sort of dry and fresh smell. I couldn’t point out what it was, or where did it even come from at first, but it was like a revelation to me and I fell for it at once, wanting to smell like that myself. Back then I’ve never imagined that that particular smell could be comprised into a bottle, even synthetically, until later on I got a glimpse of “Light Blue” and suddenly it reminded me of a unique scent. Never bought it, based on the preconception that it is eau de toilette which has a weaker concentration than the eau de perfume (theoretically); practically, in today’s commercially-feed the masses perfumes, I do tend to doubt there are any differences between the two. As I’m not even a “parfumista” but still wanting to find that perfect mysterious scent, after many sampled perfumes I ended up on the conclusion that this synthetic (carcinogenic) reminiscence of dry cedar wood, with a hint of a pleasing-subtle-invigorating-fresh breeze, is the only one that my olfactory bulb accepts and feels comfortable with. Every other ingredients based on sweet, floral, super-heavy-creamy aroma will just give me instant nausea and lasting headache. I find them to be very aggressive, bully-like I might say, like they’re in your face shouting “HERE I AM, SMELL ME!”. Sorry for the inappropriate novel which was never meant to follow on the subject, but to get on track, I gave Chloe’s “Love Story” a try and I guess it uses Iso E Super also, given that it has a cedarwood base after it dries and it lasts for days – just like you’ve described it (though the opening and middle notes smell like a bland, diluted soap/shampoo). Still, it’s not pleasing me to perfection. As I can see you’ve done your research on the perfumery field, and you’ve made it clear that you can’t stand the smell of Iso E Super anymore, so I guess it’s pointless asking for some perfume recommendations that are using similar accords and are worth trying. Alex: some people DO equate Iso E Super with “cedar”…but knowing what real cedar smells like, I’m not fooled. Many people ask me what my most hated ingredients are and when I think about my answers I realize some of my favorite perfumes contain those ingredients…in amounts that are just perfect (not obnoxious). No doubt one of my favorite new releases has Iso E Super: Diptyque Oud Palao. But Oud Palao uses Iso E Super with an expert hand…it seems to push what I like to interesting places and Iso E Super itself “stays in its place.” I don’t become aware of it till it’s time to shower…usually 11 hours into wear. Apart from the Iso E Super-heavy scents mentioned in the comments and my post, have you tried Christian Lacroix Tumulte for Men? It’s been discontinued but is usually easy to find at discounters. It’s cedar rich and smells fantastic.